Two games into the 1987 NFL season, the Players Association struck. The issue was free agency. To break the union, team owners hired replacements. For 3 weeks, they played. One of those substitute athletes — derisively called “scabs,” though “replacement player” is the preferred term — was Skip Lane. He was well known in Westport. Lane was a 1979 graduate of Staples High School — where he starred at quarterback for his father, legendary coach Paul Lane — and then at the University of Mississippi. Yet with only 5 Canadian Football League games behind him – and brief stints with the New York Jets and Kansas City Chiefs, after college — he was unknown to much of the football-loving American public. In 1987 Lane was out of the game, working in commercial real estate in Fairfield County — a job he still holds. But he excelled as a safety with the replacement Washington Redskins. 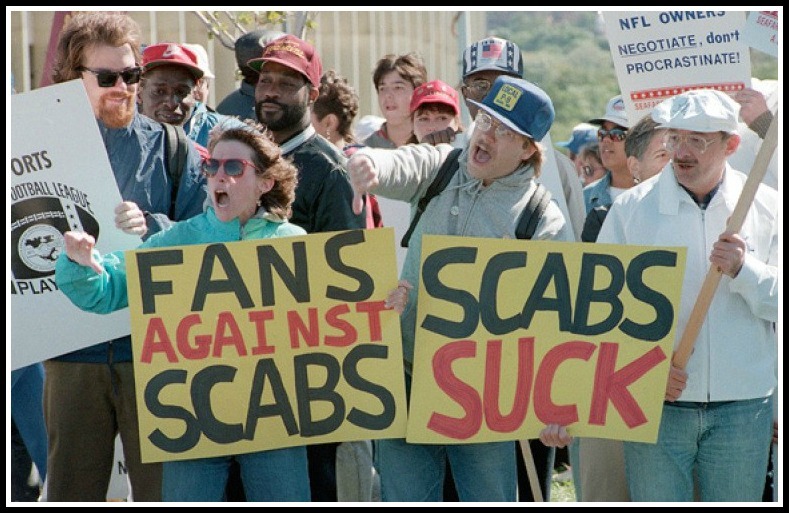 They went 3-0 during the strike, culminating with a Monday Night Football win over a Dallas Cowboys team filled with veterans who had crossed the picket line. Some fans wanted familiar players back. When the 3-game strike was over, the Redskins released Lane. They went on to win the Super Bowl — but neither Lane nor his fellow replacements received a championship ring. That story was part of an ESPN “30 For 30” documentary that aired in September. “Year of the Scab” explored the lives of the 1500 replacement players. They were “caught in the crosshairs of media fueled controversy between owners, players and fans alike,” the network said. Lane was featured frequently in the video. He mentioned his “buddies from Westport” who attended the game against the Giants. There were only 9,000 fans that day. Over the years, Lane had no contact at all with the Redskins. But the ESPN documentary created a groundswell of support for righting a wrong: getting rings for the replacement players. Washington probably would not have reached the Super Bowl without them. Yesterday — in a brief ceremony at the Redskins’ practice facility — Lane and his former teammates got their rings. 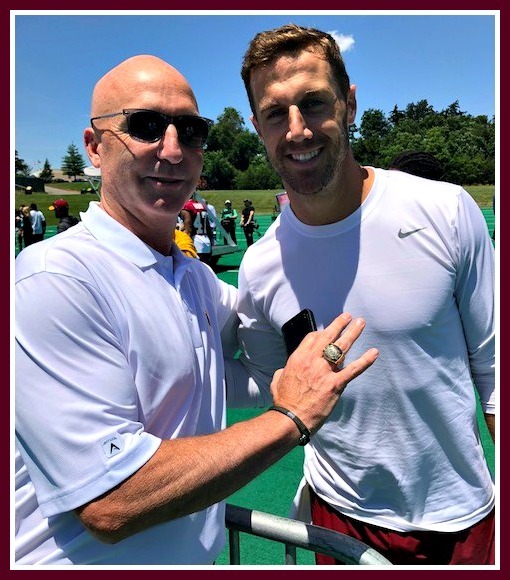 Skip Lane shows his Super Bowl ring to current Washington Redskins quarterback Alex Smith. This entry was posted in Categories, Media, People, Sports, Staples HS and tagged Skip Lane, Super Bow XXI, Washington Redskins. Bookmark the permalink. As a longtime Redskins fan – it’s about time!!! Congratulations Skip!! Fabulous!!! He deserves it. He contributed to the team and their record which got them into the playoffs. As a Giants season ticketholder I went to a couple of those games strike games. Congrats Skip! I’ll have to track you down,would like to see it. Does the ring throw off Skip’s golf swing? Congrats!! Great job Skip. The Redskins owed you. A great story for a member of a great Westport family!!! Not just Westport’s own Skip Lane, but so well known to many of us – Skip is a big part of Westport. Congrats on the ring Skip, that’s beyond cool. Great news, congratulations Skip ! What al of you seem to be ignoring is that Skip and the other “replacement players” were strikebreakers. Don’t Hate, you’re just jealous..
Bobbie, That thought briefly crossed my mind too. I was certainly raised to always respect the fundamental rights of workers (including the right to strike) and I have never crossed a picket line in my life. But, you know, these weren’t coal miners striking because of unsafe working conditions or for a basic livable wage – these were highly paid professional athletes fighting wealthy team owners over money. Both sides were going to be just fine at the end of the day – and they were. So, yes technically Skip and the others were scabs but realistically? No way. No ones work safety or dignity were ever on the line here. So I have no problems with celebrating Skip’s 3 weeks in the pros. Enjoy your Super Bowl Ring Skip. It is long overdue. I think you forget that 1) not all the players on an NFL roster are highly paid, 2) at the time, they were fighting for free agency so they could become highly paid, 3) work safety in the NFL was a joke though no one really knew about CTE (except maybe the owners), 4) unlike the NBA and MLB there were (and are) few guaranteed contracts with most players at risk of losing their livelihoods every week should the team chose to cut them due to injury or otherwise. The fact that NFL “careers” tend to be very short gives the owners an inordinate amount of power over the players, the bulk of whom are far from set for life when they retire. Putting aside the merits, at least someone commenting here is being internally consistent. I suspect that if “replacement workers” were being brought in to replace striking police, firefighters or any other union workers in Westport, both the replacement workers and town government would be excoriated by a good number of the commenters on this post. Of course, it’s harder to be sympathetic toward striking professional athletes apparently making tons of money whom one doesn’t know as opposed to local police or firefighters. Then again, with what’s come out about the NFL, it’s even harder to be sympathetic to the owners.